Imagine you are eating at Hogwarts with this Harry Potter four piece dinner set! The set features the Platform 9¾ sign, signifying the secret entrance at Kings Cross, starting point for all budding witches and wizards. Underneath the sign is the phrase: HOGWARTS EXPRESS in yellow capital letters, on a deep claret red background. 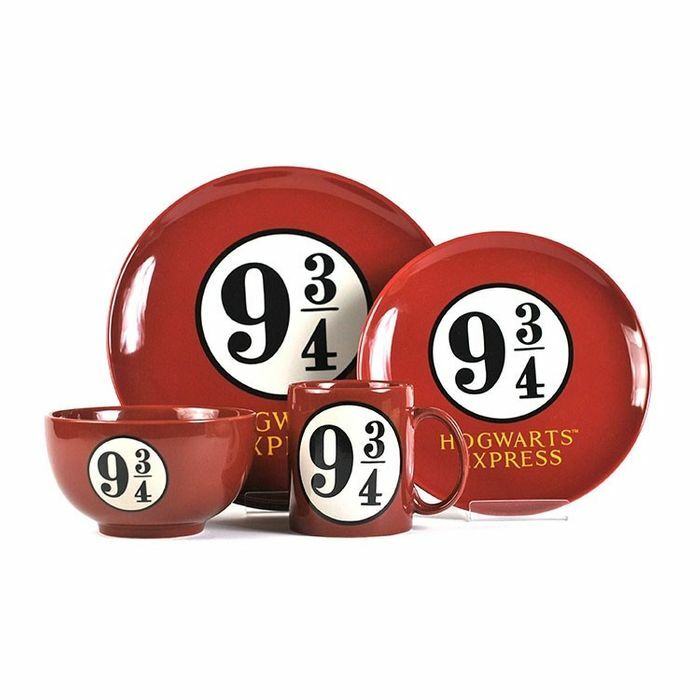 The magical set includes a large and small plate, a bowl, and a mug, just right for a sorcerer or sorceress to use, and a great gift for any Harry Potter fans. There are four items in the set, a large plate, with a diameter of 25.5cm, a small plate, with a diameter of 20cm, a mug, with a height of 10cm and a diameter of 8cm, and a bowl, with a height of 8cm and a top diameter of 14cm. The dining set comes in official Harry Potter themed box, measuring 28cm wide, 13cm high, and 28cm deep. This makes it a fantastic gift for any fan of JK Rowling’s masterpiece! What do you think of this Campus Gifts deal? Just sent the link to my nephew Jack,his cousin Sian who is currently winging her way to Rome to celebrate her 25th with her bf.. Sent to my God Daughter Chloe too..